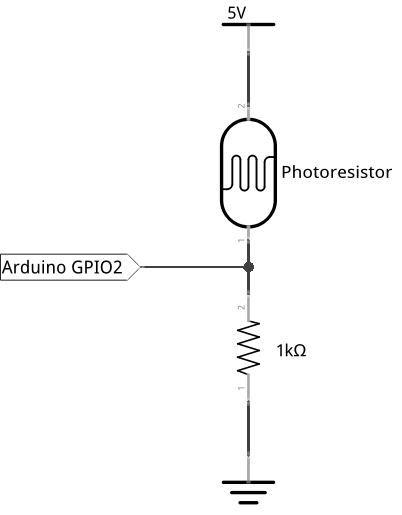 In this tutorial, we will use a photoresistor to detect the ambient light intensity. In order to be able to actually detect the light intensity, we’ll need a voltage divider in our circuit. We’ll also be sending data from the ATmega to the Omega through the serial port. Let’s dive in! 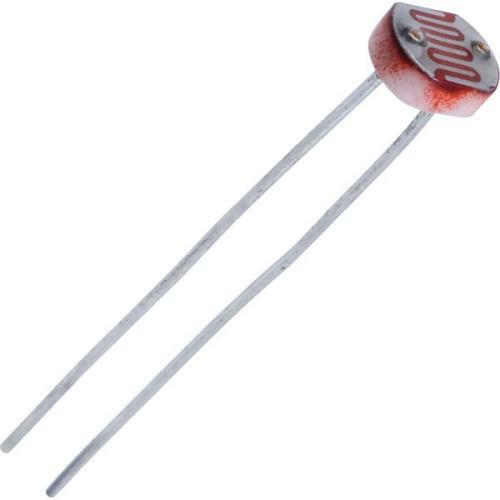 A photoresistor has a variable resistance based on the intensity of the light hitting it. 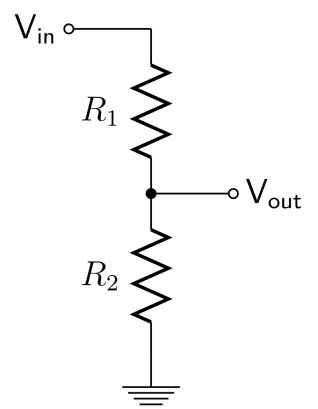 However, its light intensity is inversely proportional to its resistance: the resistance will decrease when the environment has more light, and increase when there is less light. The photoresistor is made out of a semiconductor with high resistance and can go up to megohms when the environment is dark. For this circuit we will need use a photoresistor and a 1k resistor to make a voltage divider on a breadboard. We will be using jumper wires for the connections. Using the equation for the voltage divider, we will be able to determine the resistance of the photoresistor and then calculate the light intensity. Connect one end of the photoresistor to 5V and the other end to the 1k resistor (the polarity does not matter). Connect the other end of the 1k resistor to GND. 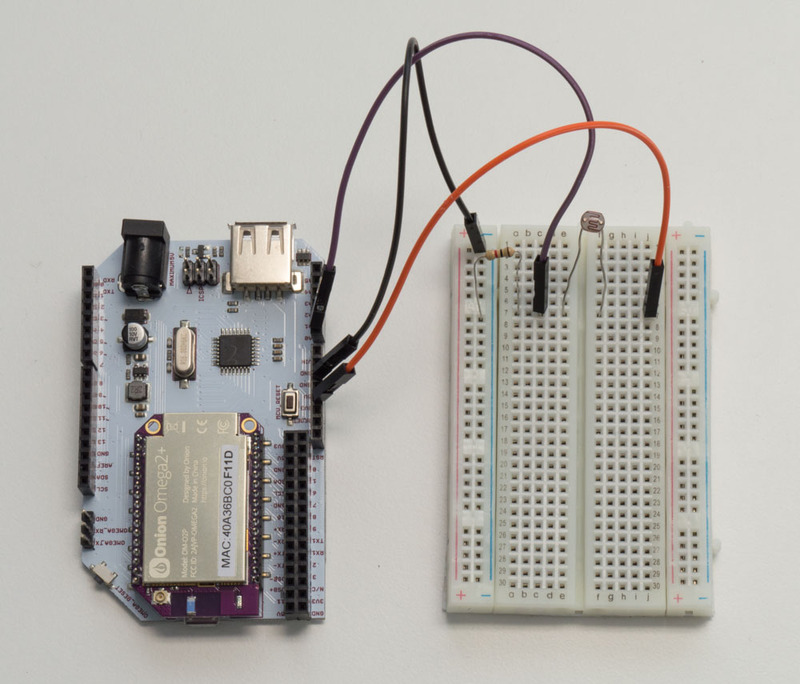 Connect the middle point between the photoresistor and resistor to the A0 analog pin on the Arduino Dock. For this experiment, the code doesn’t activate anything, it will simply calculate and print out the resistance and the light intensity level to the console. If you’re ready, copy the code below to SKA06-photoresistor.ino and flash it to start reading the light levels! If you cover the photoresistor with your hand, you’ll see on your Omega’s command line that the light intensity (lux) value will decrease significantly. You’ll also see how the resistance of the photoresistor is inverse proportional to the light intensity. The code we use is fairly straight forward: we use analogRead to obtain a digital value (0 to 1023), then we convert that data to both voltage and light intensity. During the calculations, we use Serial.print() to send the values at all the stages to the Omega for better understanding the calculation process. We’ll briefly touch on communicating with serial in case you missed the last experiment, and we’ll go over output formatting in C.
Last time, we covered how serial communication works in general, and specifically how it works between the ATmega and the Omega. In case you missed it, serial communication is simply communication where only a single channel is used. Because of that limitation, one party must be set up to listen while the other talks. With the Arduino Dock, we’ve hooked up the serial output of the ATmega chip directly to a UART pin on the Omega, which means that everything is set up for the Omega to listen to the ATmega! The above is completely valid in Python, and will print out Number is 12 complete with a new line. To get the same kind of results with Arduino code, we resort to some fiddling to place new line characters and other parts of the string in the appropriate order. Which is a bit more convoluted, but works just as well with the functions we have access to.